As a new real estate agent, you’re often faced with so much information that you don’t know which way to go. I have written some great content to help you market yourself and your new real estate business. The following articles offer branding and marketing tips for new real estate agents. Your personal and business brands and web presence are the foundation for all the marketing you’ll do for your business. But let’s focus on your personal brand first. As a new real estate agent, it’s crucial that you get your story out to your community. Your story differentiates you from the other real estate professionals in your area. Your story and identity will help you establish personal brand standards that will guide you in your marketing efforts. Building your business brand is the next logical step after you establish your personal brand. This is especially important for agent teams and brokerage firms. Business brand building captures the stories and culture of a team and makes sure it’s essence is all represented in the marketing and visual assets (logo, yard signs etc.). Your email, social media, and offline marketing straights should flow through the filter of your business brand. A logo is another important asset for your visual brand. Be sure to put thought and meaning into the design of your logo. Establishing and growing your web presence is the last of the branding and marketing tips for new real estate agents for today. Whether you outsource development and design or you go with a solution like BoomTown (affiliate link) that focuses on building powerful websites for real estate pros, you must get it done. You can’t depend on your broker to establish a web presence for you. Your bio and listings on the broker website is awesome but it won’t cut the mustard. Make it a goal for you to grow your hub on the web where you own the content and the leads! 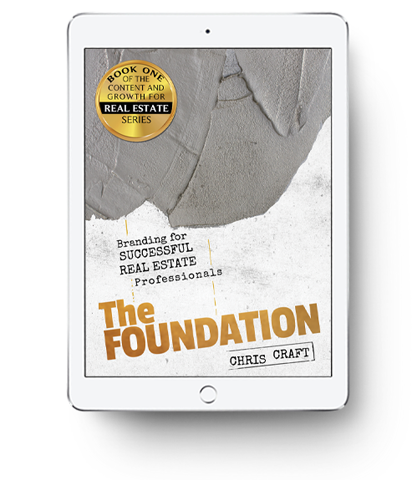 IN CHRIS CRAFT’S NEW EBOOK, THE FOUNDATION.